After a day staring at Google Analytics, spread sheets and other such delights, I like to come home and vege out in front of the PlayStation to relax. Gaming is a hobby, and like all hobbies there’s plenty of accessories and gear you can choose to blow your money on. One such accessory I came across on Reddit recently is KontrolFreek, and after purchasing from them I was very impressed with how they run their eCommerce site. They are absolutely nailing most of the important areas. 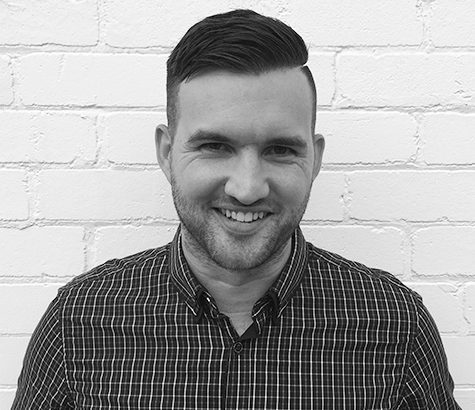 Being a digital marketing & conversion geek, I couldn’t help but analyse as I used the site. If you want to see how an eCommerce site can be done really well, read on. 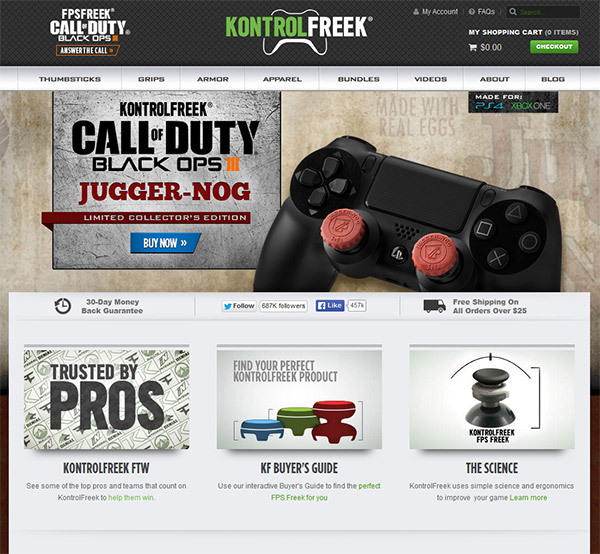 So as I mentioned, I came across people mentioning the product on Reddit, however I wasn’t really too sure what a ‘KontrolFreek’ was when I clicked through to the site. As they say, an image speaks a thousand words, and the large hero banner image spells it all out with that image of the controller. 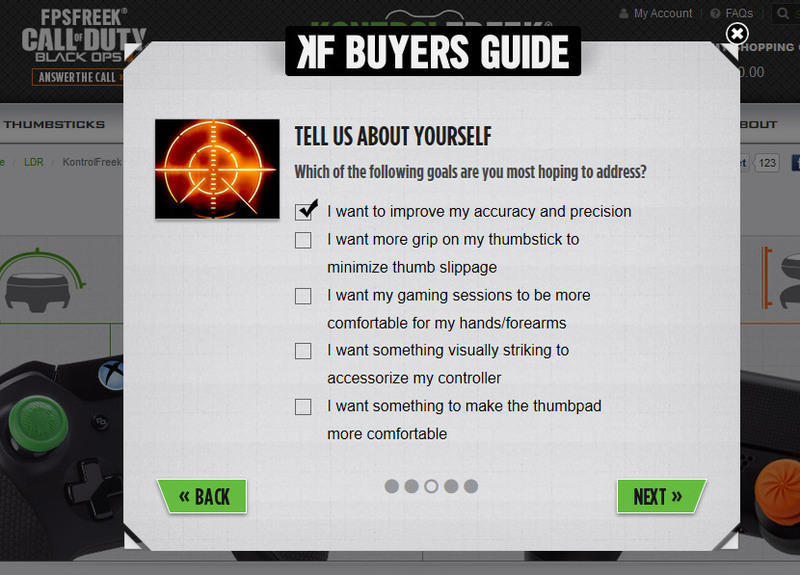 The orange attachments for the thumbsticks are clearly what these “Kontrol Freeks” are. This use of an image to show “the thing in action” as a way of quickly orientating users with the site is extremely powerful and effective. According to EyeQuant, this works because users typically “screen and glean” a website during the first moments of their visit in order to assess whether they have come to the right place. If a website passes this initial skimming test, the site is more likely to be explored longer and more thoroughly. Meanwhile, if a website is deemed by the user to be unhelpful, the user is likely to leave within the first moments of their visit, and not wait around to see if their minds can be changed. The Call of Duty Black Ops 3 logo twice. This is a new game I’m playing at the moment, so it resonated right away. I was 90% sold on the spot. I can dominate some rounds, and get absolutely destroyed in others, so something like this could help tip the scales more in my favour. It was time to find out a little more. The 30-Day Money back Guarantee meant there is very little risk in a purchase. You can try them out, and if you don’t like them send them back. They really spell things out here in the copy, and the money back guarantee badge. Their cheeky copy is irreverent and would resonate with their target audience of gamers. The inclusion of their Twitter and Facebook social following counts is a very effective form of “social proof”. According to Wikipedia, social proof, also known as informational social influence, is a psychological phenomenon where people assume the actions of others in an attempt to reflect correct behavior for a given situation. Okay. What does that mean here? In terms of an eCommerce site, this means if potential customers see a product is insanely popular on social media (over a million followers across the two channels) it will have a positive affect on how they perceive the product. There’s so much good stuff going on here. The use of the term “fans” instead of “customers” instantly draws connotations of gamers that are raving mad in love with the product. The reviews are all glowing, and the username is a link through to the actual review left on the product page. The videos each pop up in a lightbox overlay, and are well produced sales tools that highlight how you absolutely HAVE to have these. Finally, the inclusion of some of the biggest logos in the gaming world suggests the heavyweights are on-board with this product, so you should be too. The only downside here is I believe these logos should be linked to the actual reviews or articles featured on these sites. I had made my mind up – I was pretty keen to purchase. For someone who 5 minutes ago didn’t even know these existed, the choice can be overwhelming. 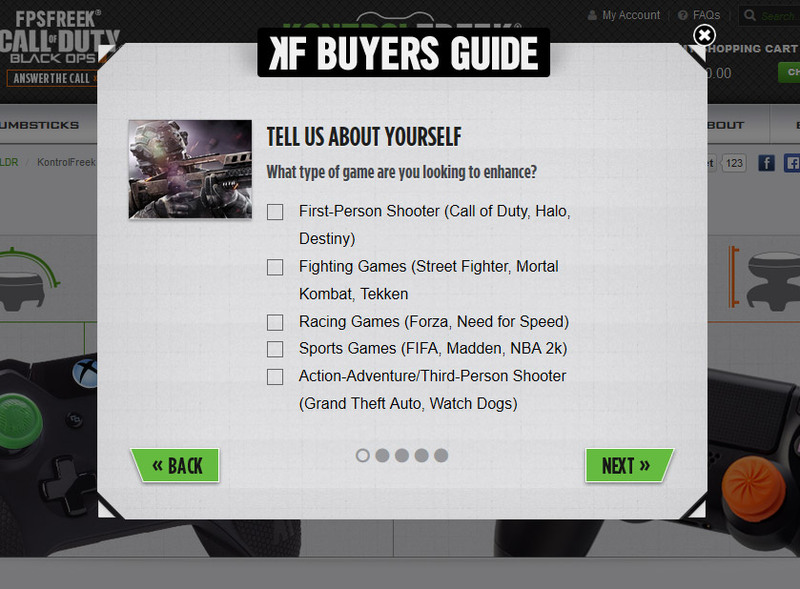 Naturally, KontrolFreek have got this covered with the inclusion of a “buyers guide” option. This can be accessed through a tile in the main menu, and a large tile on the home page. Once again, the copy is compelling. By labeling what is in reality a pretty simple survey a “KontrolFreek Recommendation Engine” it gives the perception that you will be receiving the perfect product tailored to your needs. The first reason I love the inclusion of this Buyers Guide is the psychology behind it. Two of these six topics are at play here – Reciprocity and Commitment & Consistency. As an eCommerce retailer, if you can get potential customers to make a small commitment to your business, they are more likely to eventually purchase from you. This Buyers Guide is the psychology of reciprocity and commitment at work. After taking the time to think about and give my answers to the 5 questions, and then have the perfect product recommended to me, I made a small commitment to the KontrolFreek brand. Again, the copy on this page was great, claiming “Congratulations! We found your perfect product” – it would be silly of me not to purchase now! The imagery of that perfect product was there for me to see, reinforcing what could be mine soon, if I were to purchase. I particularly liked the inclusion of the second pick. This is a nice touch, once again with well written copy. 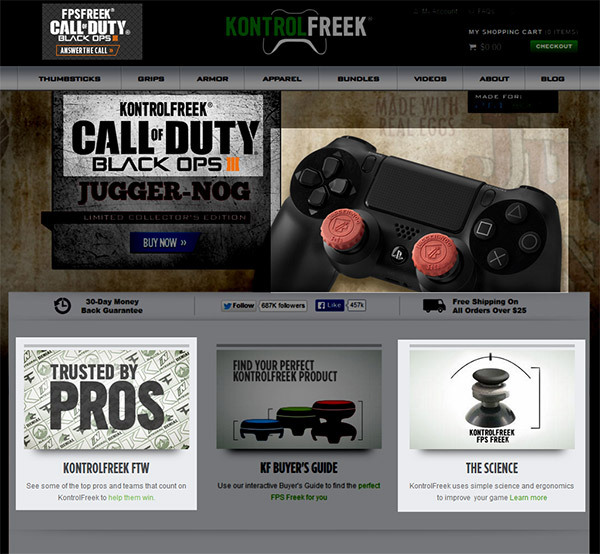 An important part of any eCommerce site is obviously the product page, and it’s no surprise to see KontrolFreek are doing it right here. Once again, there’s all sorts of eCommerce good stuff going on with this page. I’m talking really good stuff. Some of the main psychological persuasion boxes Cialdini wrote about in his book are covered here. 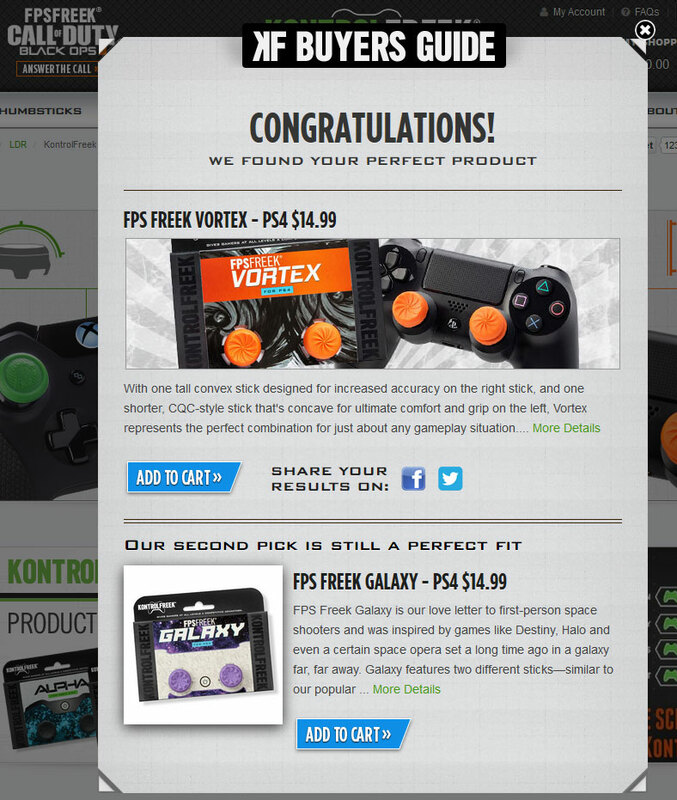 The KontrolFreek site makes use of a tactic known as “Loss Aversion”. The price is listed as $17.99, marked down 31% from $25.99. First discovered by Daniel Kahneman and his associates, loss aversion is the human tendency to strongly prefer avoiding a loss to receiving a gain. In all reality, I doubt this product is ever priced at $25.99 – the saving is entirely psychological. This tactic also ticks the “Scarcity” principle of persuasion as advocated by Cialdani. The obvious social proof at play on the product page are the reviews. This is all very compelling stuff, and helps potential buyers feel confident they’re making a good purchase. There is actually a little bit of opportunity here to improve things even further. Another form of powerful social proof is to cross-sell other related products, under the heading of “frequently bought together”. The implication with this approach is that “all these other people buy these things together, so you should too”. 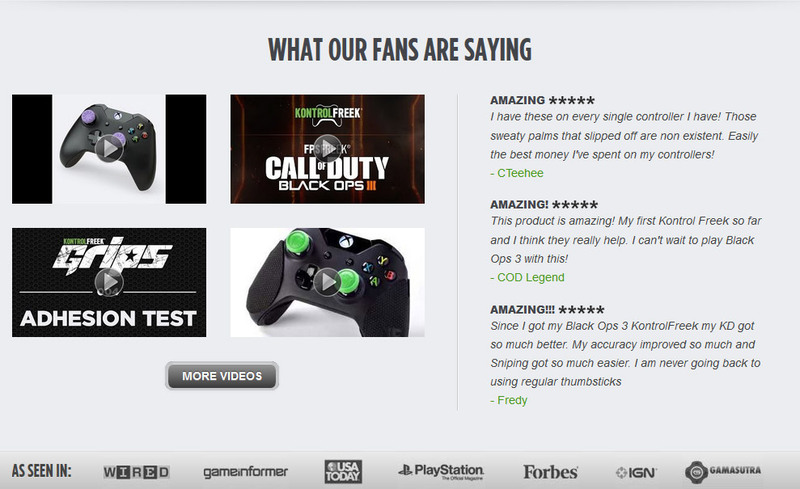 KontrolFreek should take note of the Amazon playbook, and implement this sort of social proof into the cross sell on their product page. The product page is also doing plenty of other things right. Lots of product photos, including high resolution zoomed in version. Custom copy written uniquely for each product. Reference to the types of games the product works well with, so as to intrinsically link the product with increased performance in the exact games their target demographic is playing. A list of the various controllers the product is available for. It’s all very nice indeed. 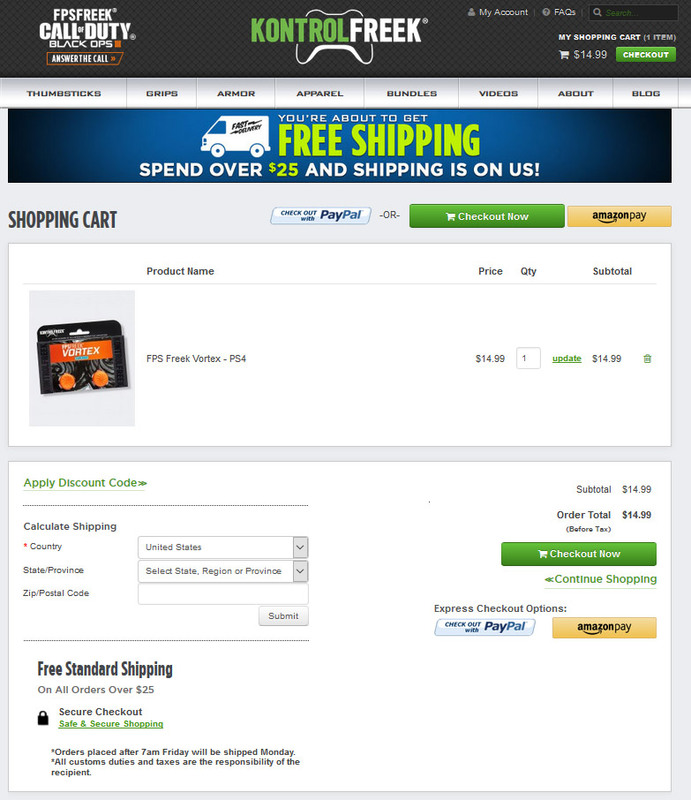 The add-to-cart/view cart/checkout flow is where the action happens on an eCommerce site. It’s where people have their wallets out, ready to purchase your wares. Nailing this part of the site can be the difference between doing okay, or absolutely raking it in. Adding a product to the cart is pretty straight forward on the site. One comment I would make here is the “add to cart” button is green. The colour green is used all throughout the site, which means this button doesn’t stand out as much as it could. I’d advise testing different colours for the mega-important call to actions like “Add to cart” and “checkout”. Apart from maybe testing a blue button for the checkout button, this is all good. The reinforcement of the 30-Day money back guarantee and the Free Shipping over $25 spend here is a nice touch. The use of the “View Cart” button is not so inutitive. You have clicked checkout in the header, it pops out with a list of what’s in your cart and then has a CTA saying to “View Cart” again. I would test repeating the “Checkout” CTA in place of the View Cart button, so the user is just clicking “Checkout” each time to move through the process. Again, applying some sort of contrasting colour to these important next steps to make them stand out against the green used all over the site would be a worthwhile test. Once again, plenty of nice stuff happening here from an eCommerce point of view. They offer multiple payment options including Credit Card, PayPal and AmazonPay. The more ways a customer can give you their money, the better. This is a great use of another persuasion tactic, that of building trust with the potential customer. There’s been plenty of studies that show customers will abandon an online purchase if there is a lack of trust. The shipping calculator displayed right near the checkout button is also good. If you enter in your details it dynamically updates the shipping cost right there. Being upfront and showing the cost of shipping is an important way to reduce cart abandonment. In fact, hidden costs are the most popular reason for people to abandon a purchase. The truth is shipping costs in general are despised by most customers in this day and age. 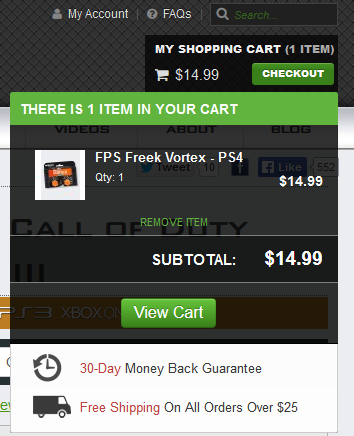 KontrolFreek make it abundantly clear that if you spend over $25 you’re entitled to free shipping. This is a great approach, for a couple of reasons. The first has already been covered – people expect to see free shipping. The second is that by setting the triggerpoint for free shipping at $25, they are able to increase their average order value. As I covered previously, the product I looked at is around $18. To trigger the free shipping, users might buy some of the related controller cleaning product, or a t-shirt, at $9.99. This knocks the amount they spend up closer to $28. By doing so, they save at least $3.55 on shipping, which means they get the extra product for $6.45 instead of $9.99. 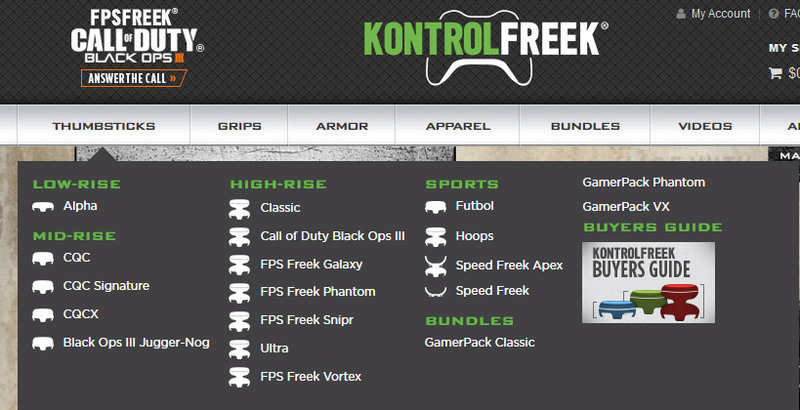 For KontrolFreek, they get $28 revenue instead of $18. 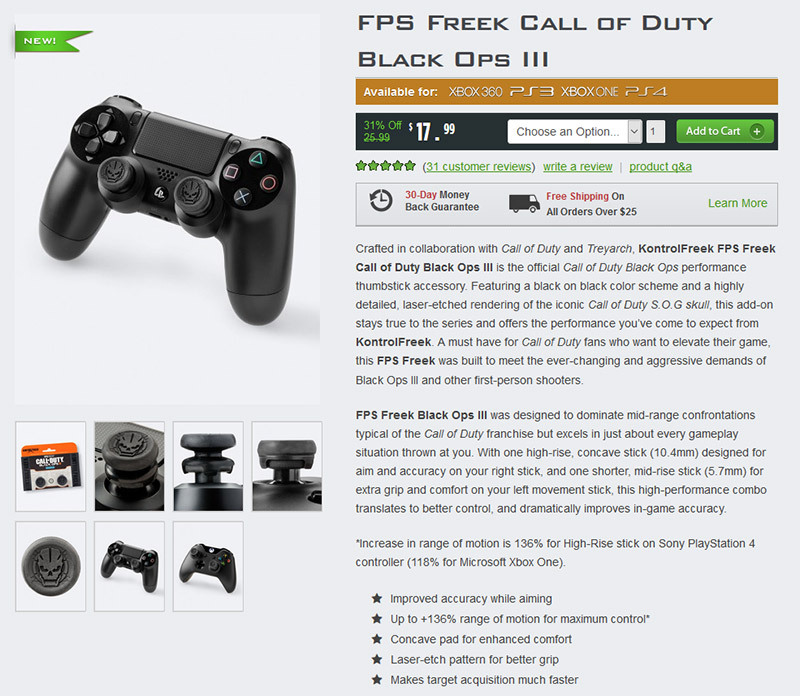 Minus the shipping costs that KontrolFreek are now covering, and they are still grossing $24.45 instead of $18. This is what’s known as a one-page checkout, and I am a fan. 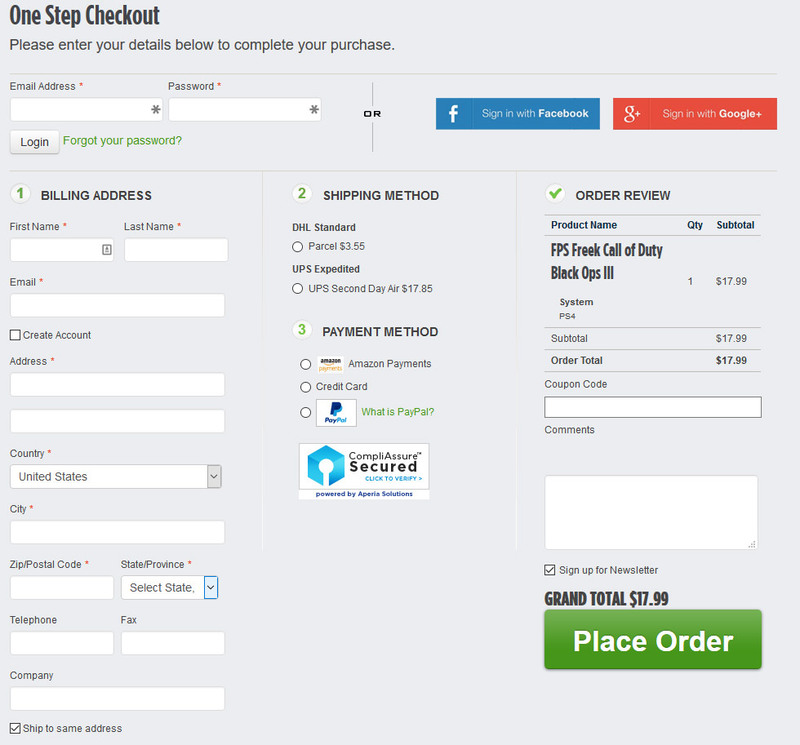 Every step of the checkout is laid out here in one page, so the user knows what they’re in for. Unfortunately, the suburb and postcode details for shipping didnt carry over from the previous step. Having them already filled on this page would have been a very nice touch. The site doesn’t require an account to checkout, however having the social check-out options prominently at the top of the page means people are likely to choose them. The payment method section is quite nice in that it responds to the option you choose. 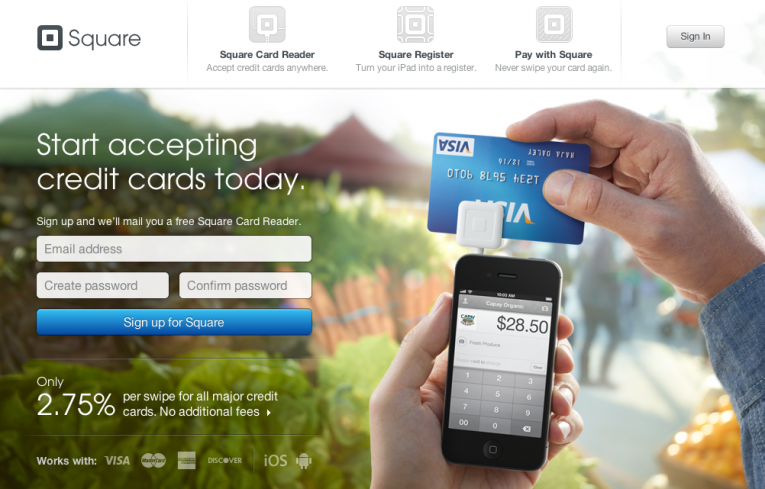 This is a really nice flow for the checkout process. Having a trust/security seal like the CompliAssure badge right at the point the user is entering their credit card details is also eCommerce best practice. Over on the right hand side the order review is standard stuff. 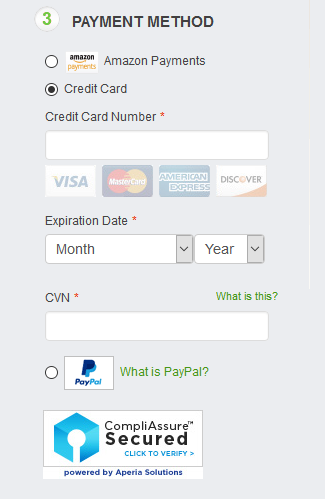 There is the inclusion of a field for Coupon Code. I was ready to pay full price, then was alerted to the fact coupons exist, so went and found one. 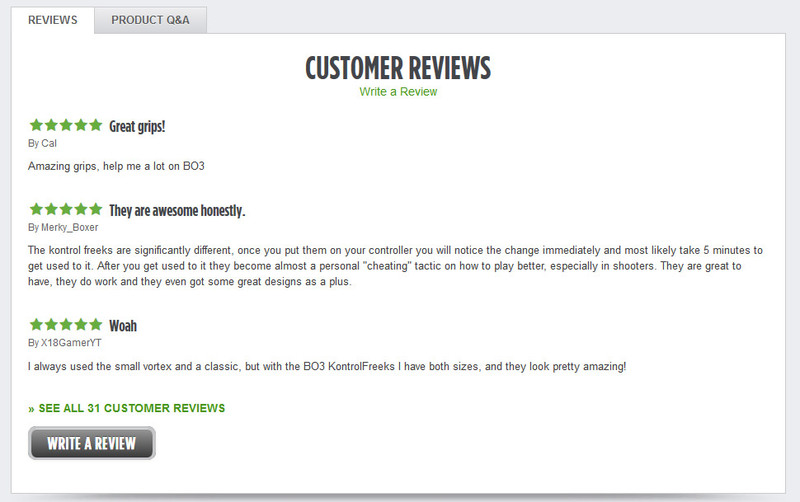 KontrolFreek missed out on $2.70 as a result. 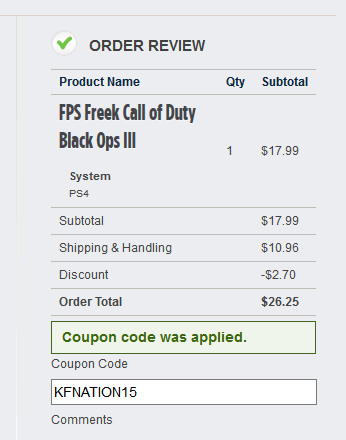 Not only that, but I got that coupon code through Retail-Me-Not, so KontrolFreek are paying them a percentage of the sale, when in reality Retail-Me-Not added absolutely no value to that transaction – they had nothing to do with it! 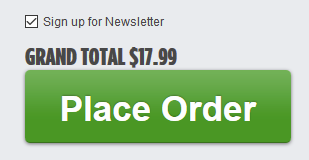 That’s an issue for KontrolFreek – they’re losing money on the sale and paying a coupon site for the privilege. I would advise addressing this by hiding the coupon code field in the checkout at all times, and only showing it specifically to users that arrive to the site via an affiliate or coupon link. You can’t miss that, and the sneaky ticked box for the newsletter would no doubt be resulting in an ever growing mailing list. So there you have it. An example of an eCommerce website that is really nailing it, and doing most things right. I look at these types of sites a lot, and the nerd in me enjoys coming across gems like this. 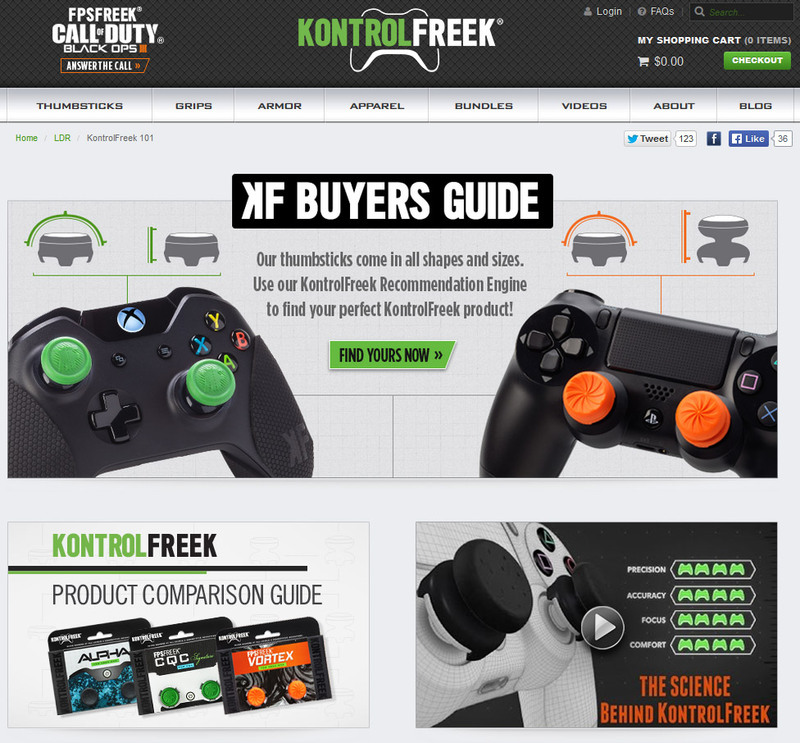 Well done to the KontrolFreek team and whoever is behind the eCommerce side of things over there. If you’re interested in having this sort of analysis done for your own eCommerce site, just head over to our Conversion Rate Optimisation page and request a free review. Otherwise, why not sign up to our mailing list? We share this sort of content from time to time.